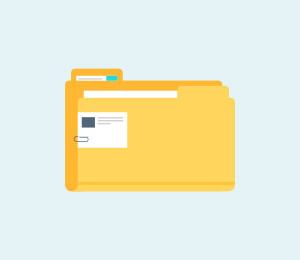 When you have a computer or laptop, it’s usual to download torrent files or movies over there. But, what if you are out on a trip and ditched the laptop, while feeling really bored in transit and need some entertainment? Well, for such times of urgency, you can always find bittorrent for Android. There are numerous Android apps swarming over the Google Play Store, which you can choose to download torrents. If you are unsure about their reliability and safety aspect, we would be happy to help you. In this article, we are listing top 10 bittorrent apps for Android, which you can easily use to meet your downloading needs. Keep reading and explore! 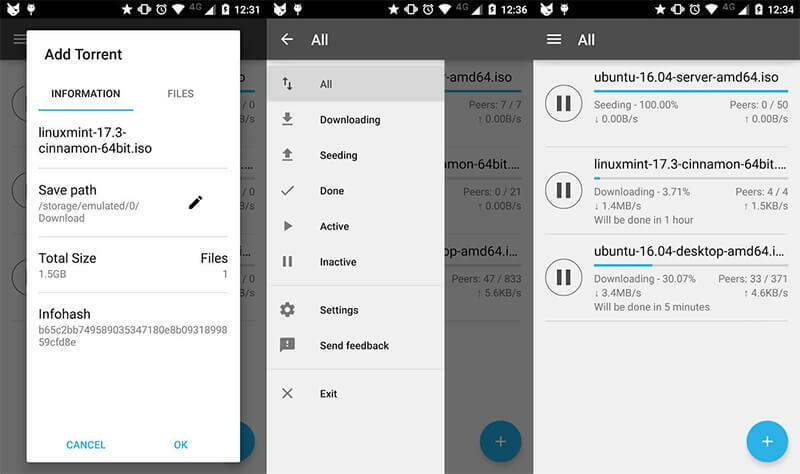 Searching for the right Android bittorrent client shouldn’t be a task for you. But, you need to keep in mind that, whether you use a computer or an Android device for downloading torrents. Your actions will come under DMCA scrutiny. Hence, to avoid that you need to make use of any VPN service for your Android device and keep your activities anonymous. When you use a VPN service, your digital footprint (your IP’s activities) is masked by the VPN. It prevents the copyright owners and internet service provider (ISP)/ local gateways from reaching you for using torrents. As a result, you bypass their tough rules that might penalize you for accessing torrent content. In public Wi-Fi networks also, VPN ensures security by preventing malware and viruses tracking down and crawling through your IP to the computer/Android phone and then leaking your personal information unethically. Even blocked websites can work like before using VPN services on Android phones. After knowing about the significance of VPN in bittorrent download for Android, would you mind learning about the best Bittorrent apps for Android? Well, in this section of the article, we are going to feature top 10 bittorrent sites that you can access over your Android phone. We would include a brief description along with the good and bad about each of the Android apps and their cost as well. You can find magnet links and download torrent files by clicking them using uTorrent Android torrent downloading app. You can download music, video and movies for free from Bittorrent’s Bundled license partners providing content. 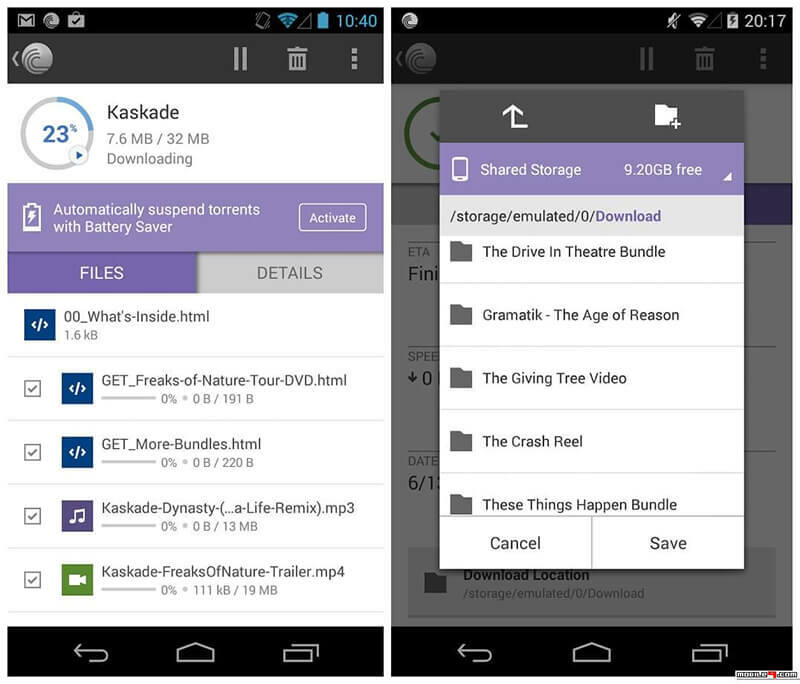 You can share files and torrents using your Android phone. Intuitive design with a light interface for the ease of operation for the users. Integrated music and video players enable better media listening and viewing experience. There are Ads in this app that might trouble you while downloading torrents. In-app purchases remove Ads and unlocks more features. 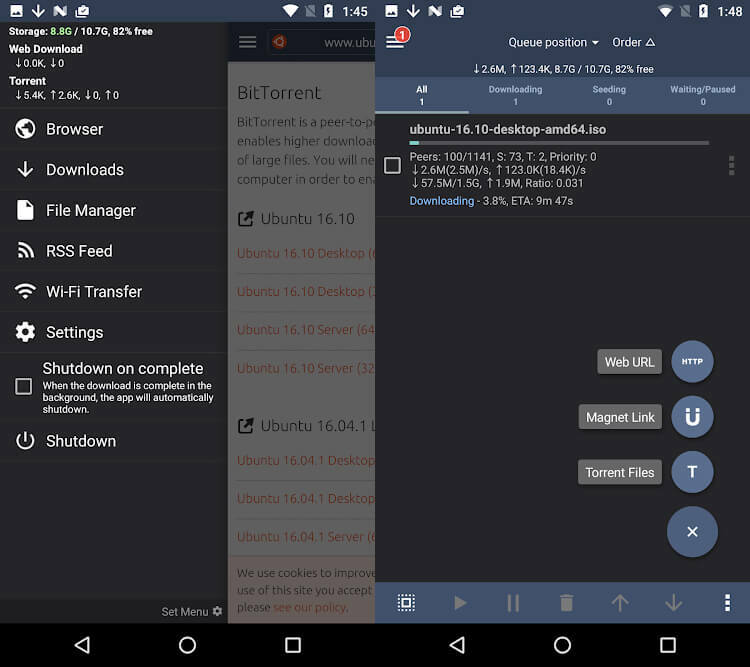 aTorrent is a popular Android bittorrent downloading app that can open torrents right on your webs browser. You can select the download folder and restrict download limit using Wi-Fi. Supports a wide variety of protocols including Bittorrent, DHT, magnet links, UDP trackers etc. You can pause the download in the absence of external power supply to the mobile. It supports magnet links and torrent search dialog. This app has numerous Ads that might annoy you. Connection loss is a critical issue to handle. This app allows you to search, download and play torrents right on your Android device. it has the most intuitive design with Wi-Fi only mode for saving your data charges. There is no size or speed limit for downloading torrents. You can download both torrents and magnet links and has enhanced performance due to core torrenting technology. Running on the fastest core it enables stable and fast connection between you and your peers. It supports torrent files as well as magnet links. This app is not meant for power users. It contains Ads that might bother you during installation. 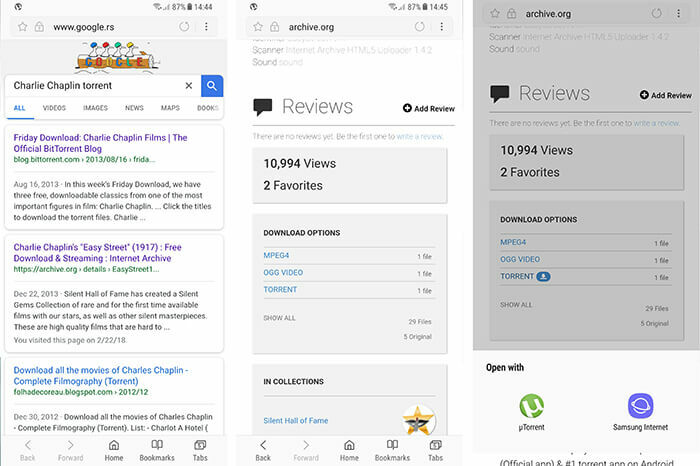 If you are looking for a hassle free searching and torrent downloading app for Android, then this is the right app for you. You can effortlessly monitor the downloading right on your Android mobile from the 3 sections on the main screen, i.e. History, Search and Downloads. 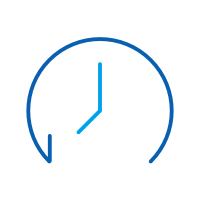 TorrDroid is extremely user friendly and is equipped with a simple UI design. You can make use of filters in order to enhance your search. Requires a strong Wi-Fi or else, you might easily lose connection and your download may get interrupted quite often. 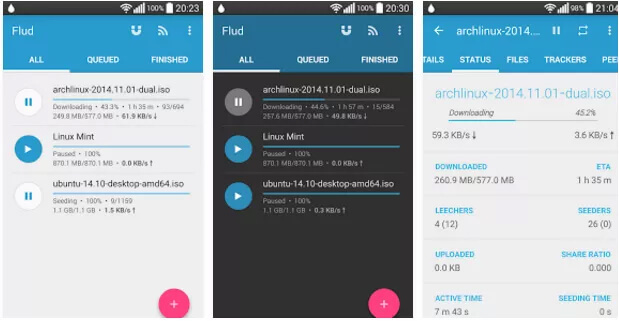 Flud Torrent Downloader is an Android bittorrent downloading app that has no speed limit for uploading or downloading torrent files. You are the one to priorities which files to download from the app. 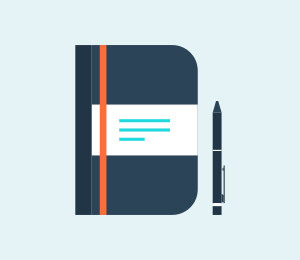 Magnet link and RSS feed are supported by this Android app. You can change the theme of the app as well as set download options to Wi-Fi only. It supports universal plug and play feature. It offers support for IP filtering, encryption, and proxy support to trackers and peers. It contains annoying Ads that might irk you during downloading torrents. The Ad-free version is paid and opens more features. This app is an apt choice if you are looking for something that can search, list, filter and sort torrents. It can also monitor and limit global speeds. You can add torrents by clicking on magnet links or torrent files with this app. You can connect it to your computer remotely to control the torrent downloading process. It is a cross platform app that can work for users accessing Transmission bittorrent client, to run on servers and computers. For more features, you need to make in-app purchases and get the full version. 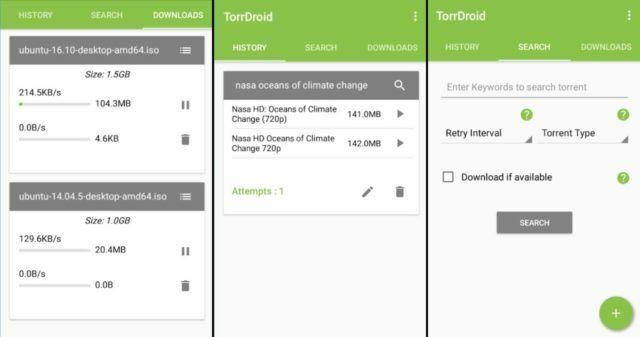 This fully features Android torrent downloader app that lets you save downloaded torrents on your desired folder. It works as a fully managed file manager for Wi-Fi file transfer. you can protect the app data with a passcode lock. It allows downloading files depending on your Android mobile’s battery status. It has an inbuilt browser along with favorites, Ads blocker, visited history and auto recognizer for torrents and magnet links. App crashes some times while downloading torrents. This app is a game changer for allowing torrents and magnet links downloading on your Android mobile. Using Wi-Fi, the services run smoother than you expect it to. You have the liberty to alter the download location of the torrent file on your device. You can download a specific part of a torrent file with this app. The intuitive interface makes sure that novice users can also use it easily. Not much features to flaunt for. 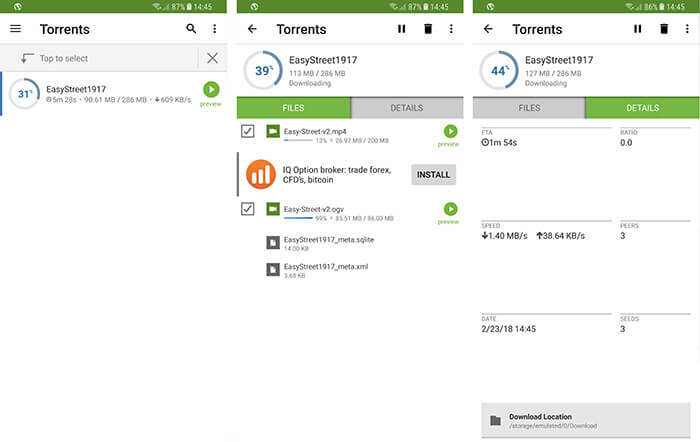 A basic app for torrent downloads on Android phones. 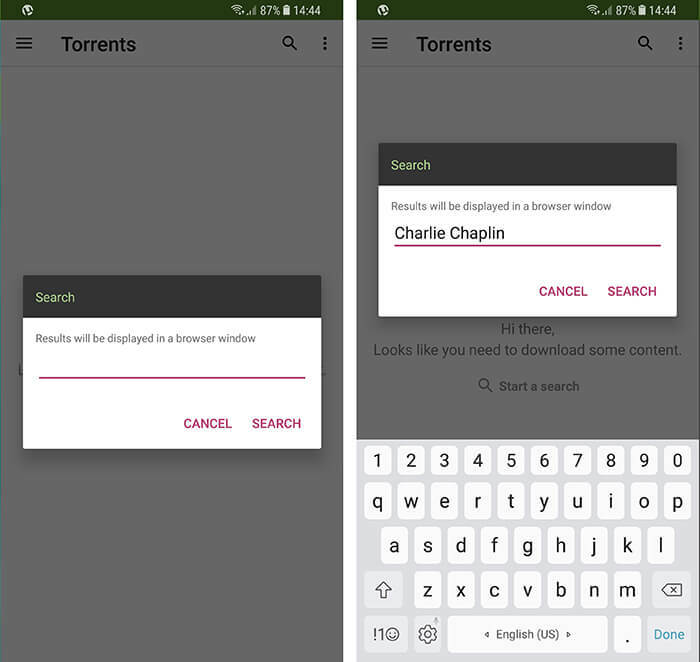 This popular bittorrent downloading app also functions as a mediocre torrent search engine. It has a media browser and music player as well. Both torrent files and magnet links are supported by FrostWire Android app. Modern features with a neat design are the life of this app. This open source app is free. The torrent search feature is not that great. It contains annoying Ads, and you need to pay for removing. Much appreciated for its speed and effectiveness aDownloader is a reliable Android bittorrent app for you. It helps you download torrent files from the web, in spite of being a bit clumsy to handle app. You can preview the video files being downloaded prior to completion of the process. Fully functional and fluid app. The interface is not much attractive. You might find it difficult to work with. In this segment, we are taking uTorrent as the Bittorrent app for Android. we would explain you, how to use a Bittorrent app on your Android mobile phone effectively. You need to download the app, prior to carrying out the exercise. Note: Running uTorrent app on Android without a VPN may expose your IP address and privacy to strangers on the torrenting peer end. Get VPN for Android. Browse to ‘Google Play Store’ and search ‘uTorrent’ app over there. Tap on the ‘Install’ button right there on your Android device. Now, launch the app on your Android phone/tablet without delay. Click on the ‘magnifying glass’ icon over the main menu for searching torrent files. Key in your torrent file name under the search phrase/keyword followed by tapping the ‘Search’ button. You need to select a desired browser or the default browser will run here for searching the keyword you have entered. Now that the torrent file is located, hit on the torrent link and immediately you’ll get connected to ‘peers’ for instant download of bittorrent files just like on your Mac or PC. 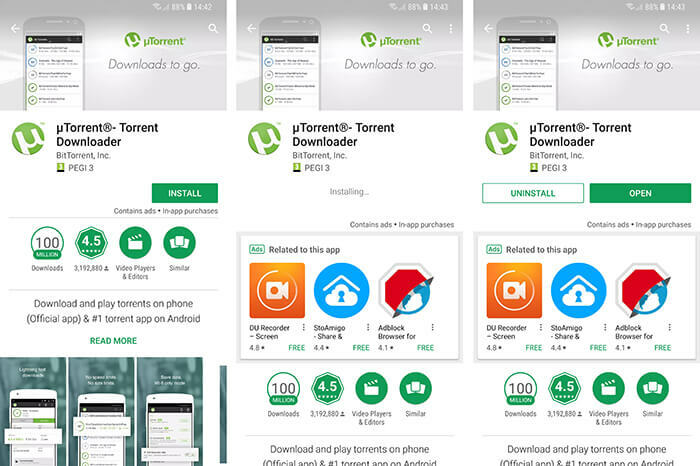 If you are browsing the web and tapped on a .torrent file, then the uTorrent app automatically launches to accomplish the downloading task on your Android phone. Torrent search engines are must-have facilities to find the best torrent sites. Sources on the best torrent search engines are often updated and safer to search for torrent sites. Here are the best 10 torrent search engines. Pirate torrents may be free but bring risks at the same time. Most users are looking to find pirate sites for free content downloads. Here we've collected 5 best legal alternatives to pirate sites to get free music, movies, game downloads without any trouble. Torrent sites are excellent sources to download software/applications for free and at higher speed. This article analyzes the advantages of software download from torrent sites, and selects the best torrent site for software by giving the most important safety tips. Keep asking yourself "how to download torrented files safely and properly" and "where to download torrents"? Here is the complete and definitive guide with everything you need to know as a P2P torrent user.